Nitidus will be playing at a sold out show this Saturday at the Ferntree Gully Hotel with Noiseworks and the Choirboys. For you lucky ticket holders, be sure to get there before 7:30, because we will be starting a little early to squeeze in a massive 12 song set! It will be a sonic feast of Nitidus classics, so don’t miss a moment! We got the running sheet with the confirmed line-up for tonight’s rock show in Frankston. Tickets are now all sold out, so for all you lucky rockers that scored a ticket, we’ll see you at the show tonight. Get ready for some fun! It’s going to be a monster night of rockin’ roll entertainment, so you are all in for a treat. If you haven’t got your ticket yet, you’d better act fast. Head over to our merch page to order yours today! T-shirts… CDs… concert tickets… get ’em while they’re hot! Our merch page has received a jump start today thanks to the addition of online shopping facilities, a feature that you guys have requested for a long time and we’re happy to finally deliver. Head over there now to get your concert tickets, cds and t-shirts with much more to come soon. All transactions are secure and powered by PayPal, which means we can accept Visa, Mastercard and of course PayPal. If you have any queries, please contact us. 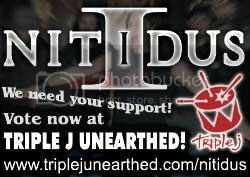 Make sure you get your tickets to see Diesel and Nitidus tear up the stage at the Chelsea Heights Hotel. They’re selling fast, so get yours today from our merch page! PayPal, Visa and Mastercard accepted.